So here’s the thing, Tomato Garlic Swiss Chard is my new favourite. I make it at least weekly, but preferably daily. Kind of like that time when I would eat those little white sugared doughnuts daily. That was fun. But we’re trying to stay healthy here, so no more powdered sugared doughnuts, or Old Fashioned doughnuts, but if you are so inclined, these Muffin Doughnuts are pretty good. I think I’ll be making them today. Last week I was deep into exam stress. Which for some people means stress eating chocolate, but for me it meant stress eating Swiss Chard. Like the way my puppy stress eats carrots during wind storms. We’re two peas in a pod me and my pup. So, being done exams means that for me, it’s officially summer! I’ve got a lot of summery fresh and yummy Spring recipes that will be coming your way over the next few months, and this is the first. Swiss Chard is at its peak during the Spring, so give this recipe a go. 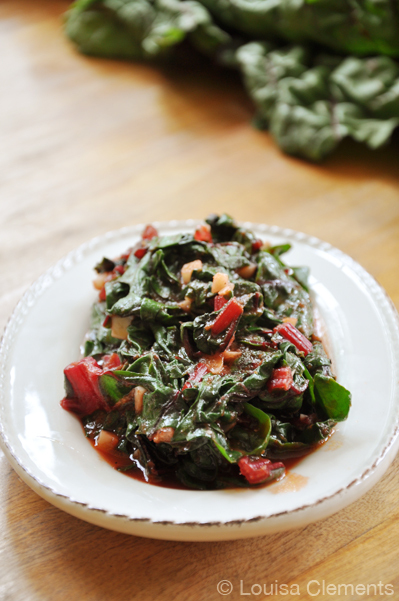 Swiss chard makes for a quick, healthy and simple side dish. Heat oil and water over medium heat, add garlic and saute for a minute. Next, add the swiss chard leaves and cook for 2-3 minutes, the leaves will wilt but have a slight crunch. Finally, add the crushed tomatoes, stirring to evenly coat swiss chard. If your life is a little packed and busy right now, I think this Tomato Garlic Swiss Chard will be a healthy snack and time saver.